I’ve been experimenting with finding a delicious, healthy, and gluten free brownie recipe and I think I finally have succeeded! 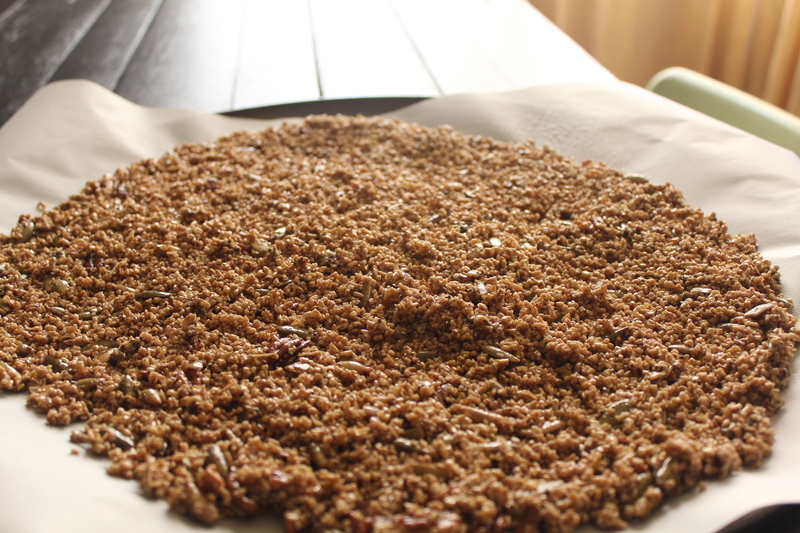 This recipe is glutenfree, grain free, high fiber, and doesn’t have ANY flour or white sugar. It can also easily be made vegan by replacing the eggs with flax or chia seed eggs (which I will cover in another post). So…it freaked me out a lot at first….but it turns out black beans are the perfect replacement for flour. I know what you must be thinking; “there is no freaking way that is going to taste good…you can’t put beans in brownies!” I thought the same thing, but I was happily mistaken when these came out ofthe oven. The black beans serve to cut out the unnecessary white flour and replace it with something less processed, low in fat, high in fiber and protein, and full of vitamins. It effectively takes out the empty nutrition from the beloved baked good and replaces it with pure, healthy goodness. These brownies are totally gooey, and chocolately; everything that a brownie should be. What I was most pleased with (and the main reason these are my go-to brownies) is that for being gluten free, they didn’t have the same texture that most gluten free boxed mixes have. Many gluten free brownies I’ve had in the past have been made from processed tapioca or corn flour mixes and end up with a very dense texture and almost sandy mouth feel. These had no such issue, and don’t actually taste like they’re missing anything (which is pretty incredible considering how much healthier these variety are). Preheat your oven to 350 degrees. Rub or spray a baking sheet with oil (so your brownies don’t stick) and set the dish aside. I used an 8″square baking pan. Take your rinsed and drained black beans and process them in a food processor until smooth. Add eggs, oil, cocoa, baking powder, vanilla, agave and pumpkin, and process until completely blended. (Be sure to stop and scrape down the sides a couple times during this step, if needed). Add 1/4 cup chocolate chips and pulse a few times. Pour into prepared baking dish. Sprinkle top with remaining chocolate chips. 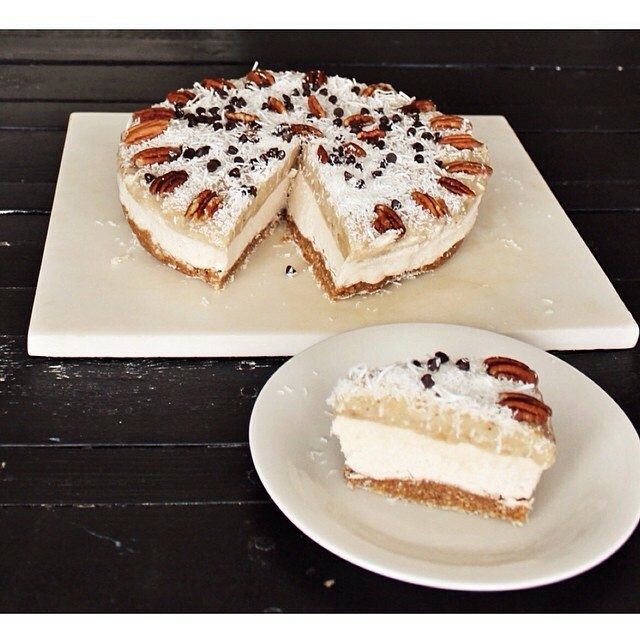 Top with shredded coconut, if desired. Bake for 30 to 35 minutes, or until a toothpick inserted in the center comes out clean. Put on a wire rack and let cool completely before serving. I am not a huge fan of heavy lunches when it’s the middle of the hundred plus degree summers, so this is one of my favorite light meals on super hot days here in AZ. I’m going to call this recipe kale “tacos”. Okay, so they’re basically salad boats made of vegetables and filled with vegetables…but I promise you they’re addictive. And who doesn’t like food that serves as an edible container? 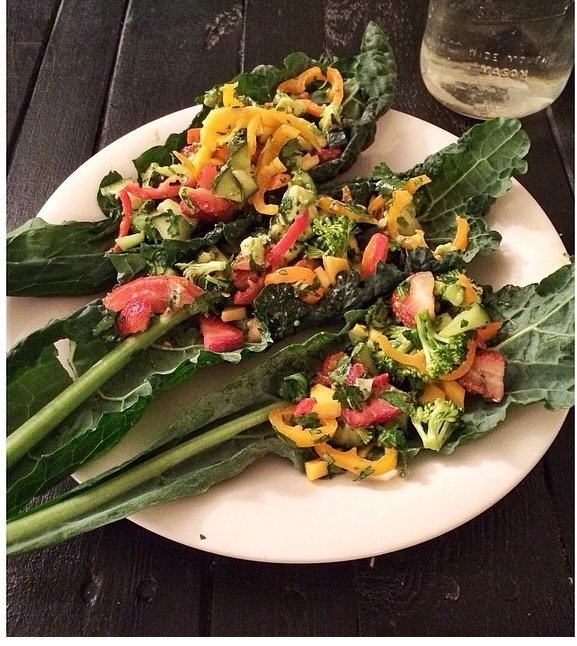 Serve whole, washed Lacinato kale leaves (this is also sometimes called dinosaur kale) topped with chopped broccoli, green, yellow, and red bell peppers, cucumber, strawberries, & cilantro. Drizzle with tahini lime dressing (1/2 tbsp of tahini/sesame paste mixed with juice of 1/2 lime & a little water). Could easily be made vegan with the substitution of Daiya (or other brand) vegan cheese and replacing the egg with a flax or chia egg. Pizza is definitely an all time favorite comfort food, but the kind you have delivered to your door has a reputation for being notoriously greasy, and full of carbs and fat. This cauliflower pizza crust is a fantastic way to replace the greasy bread with a mellow flavored, nutrient-packed vegetable instead. Cauliflower is a cruciferous vegetable that is naturally low in fat and carbohydrates and an excellent source of vitamin C, fiber, and folate. 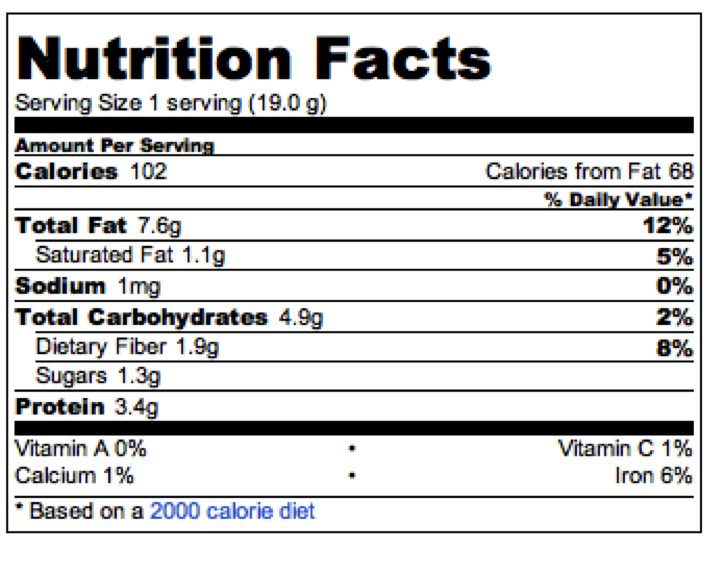 It is also a good source of choline, vitamin B6, vitamin K, potassium, manganese, vitamin B5, protein and iron. It possesses a high nutrient density, meaning that it contains a very high number of nutrients (vitamins and minerals) and a very low amount of energy (calories and fat). Nutrient dense foods, such a fruits and veggies, pack the highest levels of nutrients for the least amount of calories, making them the opposite of “empty calorie” or energy-dense foods, such as processed or sugary snacks, which carry relatively low amounts of nutrients with an excessive amount of calories or fat. 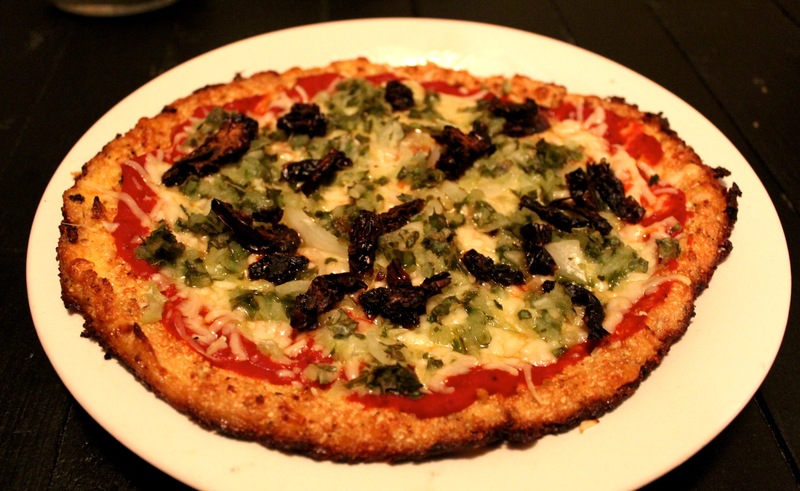 I’ve spent some time perfecting this recipe before posting, as I initially was having some trouble with my cauliflower crust sticking to the pan. The secret I discovered through trial and error: the lightly coated parchment paper is a must! The crust stuck horribly to a coated pizza pan, stone, or tin foil, but slid effortlessly off the parchment paper. The result was a pizza crust that was crispy and golden brown on the outside, soft on the inside, and easy to slice, pick up, and eat with your hands. 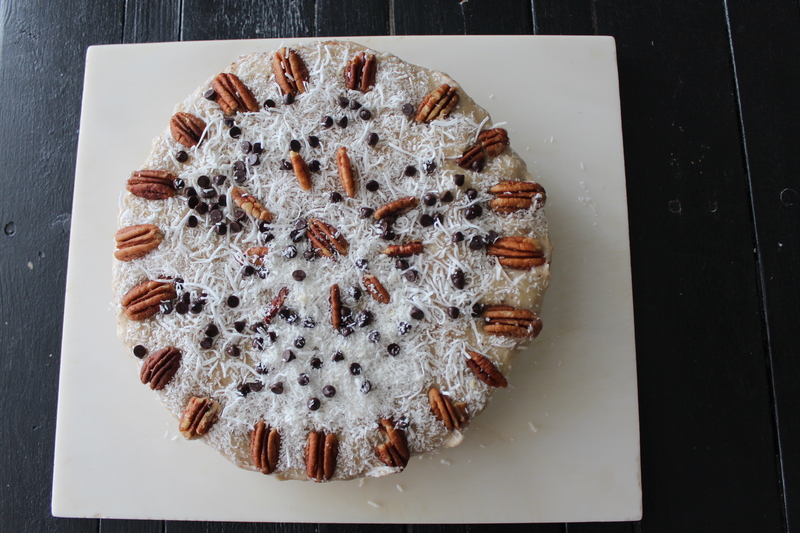 Oh, and an added bonus…it’s naturally gluten free! 2) Either grate the cauliflower using an old-fashioned cheese grater or place in the food processor until it’s a fine, grated consistency; A rice-like consistency will work just fine, but I’ve found that the finer the cauliflower is, the closer the texture in your mouth feels to real pizza crust. 4) Add eggs (or flax egg), Parmesan cheese, salt, pepper, and minced garlic to the warm cauliflower and mix well. Form into a 12-inch circle on the prepared pizza pan. Lightly brush olive oil over the surface of the crust and bake for 12-18 minutes, or until nice and golden brown. 5) Remove pizza crust from oven and top pizza with sauce, mozzarella, and basil. Add sundried tomatoes, onion and crushed red pepper flakes, or choose whatever toppings you prefer. Place the pizza back into the oven and bake for another 10 minutes, or until cheese is bubbly and melted. Let cool for a few minutes before slicing up; the pizza should easily slide off the parchment paper and onto a serving plate. 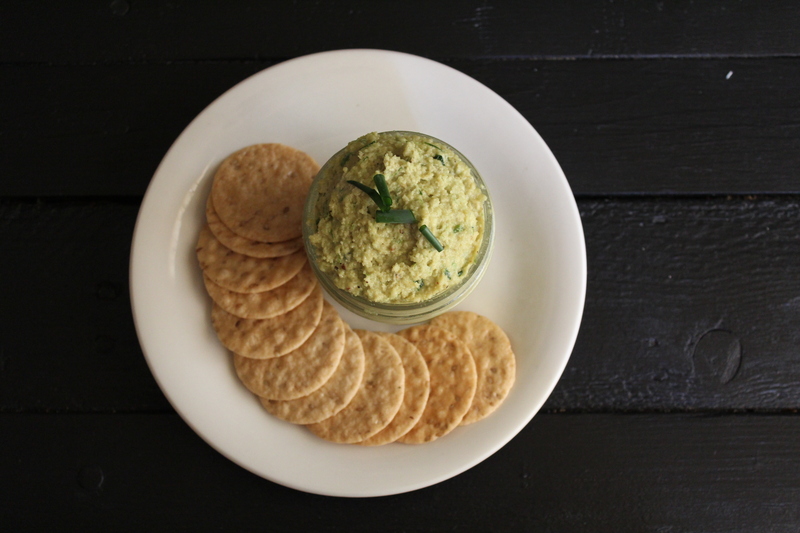 I will start by saying I am a huge lover of cashew cheese and this recipe did not disappoint. 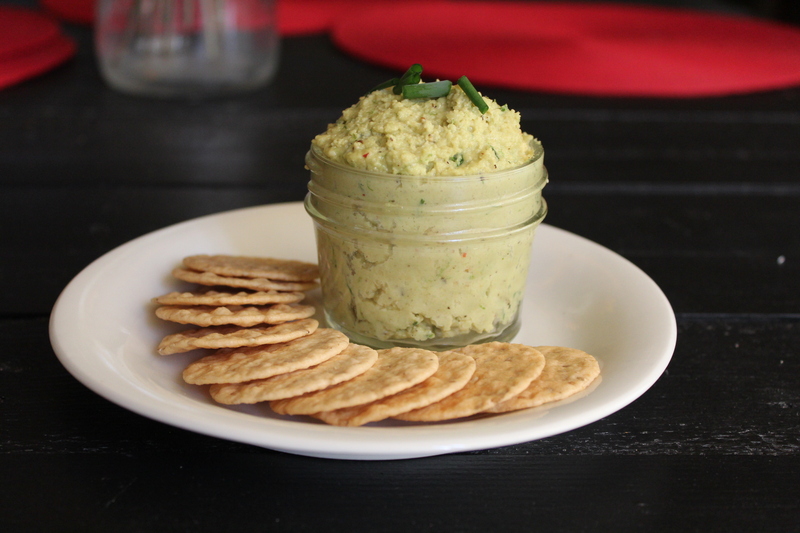 It is free of dairy, is totally vegan, and full of protein, healthy fat, and flavor. This “cheese” dip gets it’s flavor from nutritional yeast, which can be purchased at health food stores or many places online (I’ve bought it on Amazon before). 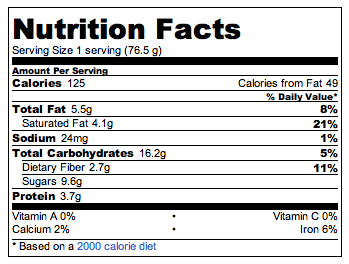 Nutritional yeast, for those who aren’t familiar with it, is a deactivated yeast that has an almost cheesy flavor. It is an awesome addition to soups, rice, as a topping for popcorn, or anything that needs that extra little bit of “cheese”. Nutritional yeast is a favorite among people on a plant-based or vegan diet because it can serve not only as a replacement to cheese, but also as a dietary supplement. It is actually a complete protein, full of B-complex vitamins (crucial for cell metabolism and energy, and a group of vitamins that can sometimes be a challenge to get enough of for non meat-eaters), and free of gluten, dairy, and sugar.